Hello and welcome to the 70th installment of the SWD. Hayaat Tahrir al-Sham released footage from yesterday’s failed attack by SAA & allies northwest of Aleppo, at least four dead pro-government soldiers were shown in the video, nowhere close to 43 dead that were claimed by some pro-rebel sources. 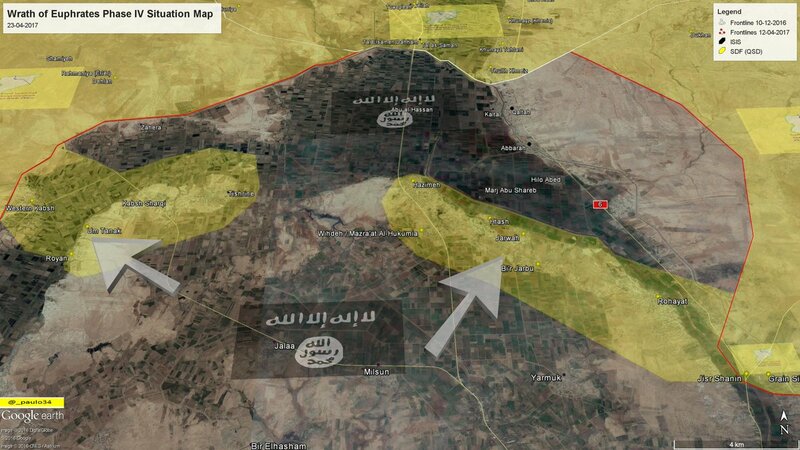 IS pocket north of Raqqa hasn’t been created yet mostly because SDF was busy repelling IS attacks in the area on two axis. 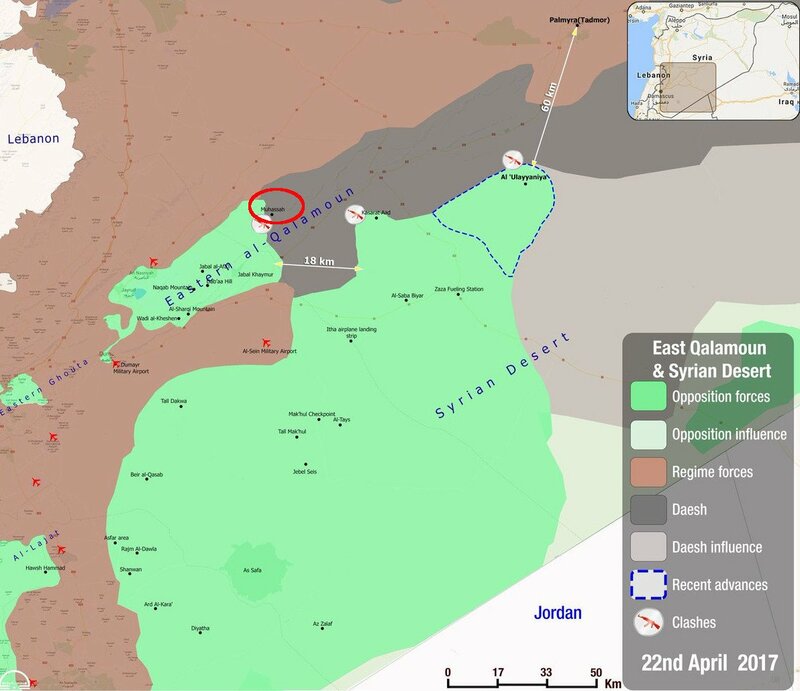 IS attacked Um Tanak-Royan and Jarwan-Bir Jarbu areas, attack could’ve been a distraction for IS fighters to leave the area SDF was about to encircle. IS attacks around Ayed al-Kabir and Tabqa Airbase aimed at lifting the siege of Tabqa city and dam were also repelled by SDF. VBIED hit rebel-held city of Maarrat al-Numaan near the former courthouse, in the attack two children were lightly injured. No one has claimed the responsibility for the attack but the usual suspects are known to everyone. SAA entered/captured Halfaya, Al-Tarabia, Sensehr, Btaysh, Haysa al-Gharbi, Zour al-Haysa and Zour Abu Zayd with little to no resistance from rebels. As expected rebels withdrew from Halfaya and surrounding localities as their supply lines were endangered by SAA. Yesterday’s ATGM launches by rebels were used to give rebels time and territory to retreat to mainland rebel territory by slowing down attacking SAA forces and making sure they don’t cut Halfaya’s supply routes as nine ATGMs were launched around Tayyibat al-Imam. However, SAA and allies got overconfident and instead of reinforcing newly captured territory by building defense positions they’ve bitten more than they could chew by attacking Al-Zilaqiat from which rebels didn’t retreat but rather even entrenched it with several ATGM teams. This sequence of events lead to another day with ATGM hits against SAA targets but much lower than yesterday. Jaysh al-Izzah launched two TOW missiles damaging/disabling one T-72 tank and destroying another one, Jaysh al-Izzah also got lucky and hit a BMP with a mortar destroying it completely. First attack by SAA & allies on Al-Zilaqiat was repelled by rebels and one SAA T-72 tank was seized by Free Syrian Army’s Al-Firqa al-Wusta (Central Division). Later in the day reports surfaced again by pro-government sources about capture of Al-Zilaqiat, however, pro-rebel sources continue to claim that Al-Zilaqiat is fully under rebel control, since this capture is contested, as always it is best to keep it as unconfirmed and wait to see what the truth really is. SAA soldiers have been accused of looting Halfaya after capturing it by rebel Halfaya-based Media Center, photos of the looting can be found here. SAA made large advances in eastern part of Tishreen neighborhood, Qaboun pocket capturing among other things localities such as Imam Hussein mosque and “power company” (Electric Grid Station). Free Syrian Army restarted their offensive against IS in Eastern Qalamoun region capturing several localities around Muhassah. Israeli strikes that targeted SAA & allies positions in Quneitra governorate on 21st of April have after all caused some casualties among the ranks of SAA & allies even though it was claimed that strikes didn’t kill/injure anyone. Three soldiers from National Defense Force’s Golan Regiment have been killed after an ammunition depot was targeted by Israel. 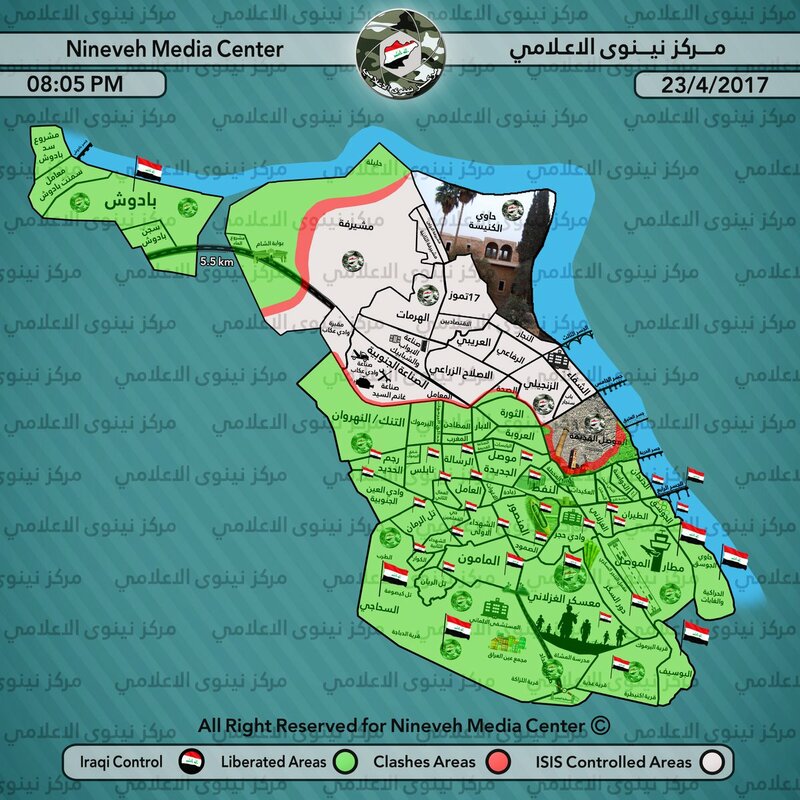 Iraqi Army captured Al-Tanak (Al-Nahrwan) district in west Mosul from Islamic State. IS launched an attack against Iraqi Army south of Mosul in Hammam al-Alil area, three suicide bombers were reportedly killed while one of them was able to detonate himself very close to Rudaw media team, the rest of the attackers fled northwest of Hammam al-Alil. The attack was launched by an IS sleeper cell in the city and the attackers wore military uniforms. According to IS media outlet Amaq Agency 25 Iraqi soldiers were killed and wounded in the attack. Situation between IS fighters remains tense in Tal Afar as the new assassination hits Tal Afar, son of IS mufti was killed by unknown gunmen. Main suspects are anti-IS sleeper cells in the city and “rival” IS fighters. Other areas where 11 strikes occurred are Abu Kamal and Al-Shadaddi destroying 16 IS oil equipment items, five IS storage tanks, four IS well heads, three IS oil pumps and a weapons cache. Full report on CJTF-OIR strikes conducted in both Syria & Iraq can be found here.